mh1983 wrote: So far so good. SIP OPTIONS Keep Alive Interval seems to have changed to a default of 30, whereas my guide calls out 20. That's the only difference I've noticed so far. Will monitor a little more before updating the guide. "Keep Alive Interval: 20 seconds"
Hi, thank you very much for your guide, I have recently acquired an HT702, updated its firmware, reset it to default and followed this guide successfully. 1) Can you tell me how I could specify, in the Dial Plan, that dialing 411 should get me to 111-111-1111, and that dialing 811 should get me to 222-222-2222? 2) I will need to configure a second HT-701/HT-702 device, but this time with voip.ms. It looks like the voip.ms configuration guide is a little dated (based on firmware 1.0.0.18). Should I still follow the outdated voip.ms guide, or follow this FPL guide instead and replace the credentials? You're in Quebec, so you don't need to do that: https://support.fongo.com/hc/en-us/arti ... 1-811-911-. But <811=2222222222> does what you're asking. I will need to configure a second HT-701/HT-702 device, but this time with voip.ms. We don't support other VoIP services here. Please contact voip.ms. I have configured both ATAs with FPL, but even though both my relatives use the same router and the same ISP, the one with the HT-702 experiences some registration issues. His device randomly loses registration, even though it is configured according to this guide. Do you have any advice? It doesn't matter if it's the same ISP unless both ATAs are located at the exact same address and attached to the same router. Intermittent congestion and connectivity issues can occur regardless of whether the same ISP is used at two different locations. 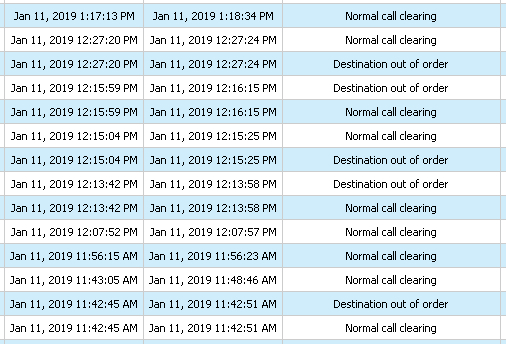 If both ATAs are at the same physical location, do not use the same Primary SIP Server in both ATAs, unless you have no other choice (i.e., unless you're forced to use voip4.freephoneline.ca:6060 due to SIP ALG problems). Local SIP and RTP ports should not be the same (if set to random the odds are unlikely). Please read the preamble (the first four pages) of this PDF guide: viewtopic.php?f=15&t=18805#p73839 (especially point #6 on page 3). I realize the guide is for a different ATA, but the preamble, generally, applies to everyone. Additionally, ensure that QoS is properly enabled for ATAs in the router being used (refer to the router manual, and also refer to page 45 in the same PDF guide). Note that only one registration per FPL account is allowed at any time. When there are multiple devices/softphones using the same account, only the most recent registration is valid. The previous device will lose registration. This is especially important to consider if someone else is using your SIP credentials (username and password) that are found after logging in at https://www.freephoneline.ca/showSipSettings (or if you're trying to register your FPL account with a smartphone SIP app or with another device). Registration is required for incoming calls. It is not required for outgoing calls. If you simply want to make outgoing calls using your FPL number, configure, but don't register the account, on the SIP app being used. This is also important to consider if you're using Freephoneline's desktop application (don't have it running while using your ATA with the same FPL account). Additionally, keep in mind that if someone else is also attempting to register the same SIP credentials on another device where you live, too many registration attempts can result in a temporary IP ban. If your ATA makes more than 5 registration attempts in 5 minutes, you may end up being temporarily IP banned by the specific FPL server the ATA was sending registration requests to. If you're temporarily IP banned, you could then try switching ProxyServer (refer to pages 14, 20, and 21) to a different FPL server than the one you were previously using (voip.freephoneline.ca, voip2.freephoneline.ca, or voip4.freephoneline.ca:6060), unless you need to use voip4.freephoneline.ca:6060 because you have SIP ALG forced on in your router. The purpose of voip4.freephoneline.ca:6060 is to circumvent SIP ALG features in routers. Each time you reboot an ATA, it attempts to register with FPL. mh1983, how is it working with the new firmware? Any issues? This issue comes and goes, so I’m not sure it this is related to my old firmware OR old settings OR this is normal and everyone encounter this from time to time? I just updated my settings how it outlined in your 5th guide. Should I update to a new firmware? By the way mh1983, you should update your profile, as now you are using a new firmware. If rebooting helps with local SIP port set to random, a corrupted NAT association likely developed between your router and your ATA. The problem can arise due to your router's UDP timeout values (point #3 below). Your ATA needs to be registered with FPL in order to receive incoming calls. The next time you encounter this issue, check registration in the ATA and also after logging in at https://www.freephoneline.ca/showSipSettings. SIP status needs to show "connected." Also, the SIP user agent needs to show your ATA. It's not normal behaviour for a properly configured ATA used in conjunction with a good router (as defined in the second post below), unless your internet service is dropping intermittently. 1. Use this PDF guide to ensure your ATA is configured properly: viewtopic.php?f=15&t=18839#p74000. 2. Proper device reboot order is always modem-->router (wait for Wi-Fi SSIDs to populate first)-->ATA (in that order). When a modem leases a new IP address, a problem can arise where prior associations using the old IP address are maintained in the router. When the ATA attempts to communicate using the old IP address, the response is unreplied, and then if the UDP Unreplied timeout is greater than the Keep Alive Interval (and UDP Unreplied timeout is often set to 30 by default in consumer routers) a problem arises where the corrupted connection persists. If UDP Unreplied timeout is, for example, 17, and the NAT (SIP Options) Keep Alive Interval is 20, then the corrupted connection will timeout or close. A new connection will be created, and everything will work fine. Another problem can occur when the Keep-Alive interval is greater than UDP Assured Timeout (often 180 by default in consumer routers): the NAT hole will close due to the ATA not communicating frequently enough with the SIP server. In turn, incoming calls may, intermittently, not reach the ATA. Again, SIP OPTIONS Keep Alive Interval is supposed to be 20 with FPL. If the ATA loses registration for any reason, incoming calls won't work on it. Note that only one registration per FPL account is allowed at any time. When there are multiple devices/softphones using the same account, only the most recent registration is valid. The previous device will lose registration. This is especially important to consider if someone else is using your SIP credentials (username and password) that are found after logging in at https://www.freephoneline.ca/showSipSettings (or if you're trying to register your FPL account with a smartphone SIP app or with another device). Registration is required for incoming calls. It is not required for outgoing calls. If you simply want to make outgoing calls using your FPL number, configure, but don't register the account, on the SIP app being used. This is also important to consider if you're using Freephoneline's desktop application (don't have it running while using your ATA with the same FPL account). Additionally, keep in mind that if someone else is also attempting to register the same SIP credentials on another device where you live, too many registration attempts can result in a temporary IP ban. Always check registration status in the IP Phone and also your SIP status after logging in at https://www.freephoneline.ca/showSipSettings. If you see a device listed under SIP User Agent that you don't recognize, you've either been hacked or someone else is using your Freephoneline SIP username and SIP Password. Always check registration status both in your ATA first and at https://www.freephoneline.ca/showSipSettings if incoming calls aren't being received. and D) A router that lets you adjust both Unreplied and Assured UDP timeouts. Liptonbrisk All my setting are set correctly on ATA. I have been using it this way for year and a half. I have just one ATA and no one else is using my credentials! Thank you for trying to help, but your replies seems like generalized information! Being hard to understand, you keep giving references to Obihai ATAs (which clearly I don’t have) that brings even more confusion! From my profile you should see that I am using modem/router combo that was purchased aftermarket (not provided by ISP). I cannot find “UDP Unreplied Timeout” or “UDP Assured Timeout” on my modem. I have settings to turn NAT “off or on”, I can see NAT Table, no other settings for NAT. My ATA displays “Unknown NAT”. My QoS never been set, as I do not know which numbers to input. Only one computer used for Internet, no other devices connected. Thank you for trying to help, but your replies seems like generalized information! SIP is a protocol that shares basic characteristics across SIP providers and devices. More importantly, certain aspects of how Freephoneline functions is dependent upon individual router settings. The related settings are described for your ATA. These settings also appear in your ATA. Simply because something else is mentioned doesn't mean that information doesn't apply to you. It does. I'm well aware of what you don't have. Rolling your eyes at me isn't going to solve your problem, and I suspect, in general, that behaviour doesn't endear you to those who not only have knowledge but are also willing to take the time to assist you for free. I stated, in my second response, "Typically it's far better to have your own router [with the features I mentioned]" for a reason. There's also a reason why that information about UDP timeouts is duplicated in the PDF guide you're using. Rest assured, I will refrain from attempting to assist you further. I wish you well in your future endeavors. Liptonbrisk wrote: Rest assured, I will refrain from attempting to assist you further, especially since you have a clear understanding of how Freephoneline, SIP protocol, UDP timeouts, and your ATA operate. I wish you well in your future endeavors. Liptonbrisk Well, thank you very much! English is my second language; you dump so much new information/words on me that I heard for the first time in my life; I have to read it again and again, trying to understand it and then you get upset with me??? GenChick wrote: English is my second language; you dump so much new information/words on me that I heard for the first time in my life; I have to read it again and again, trying to understand it and then you get upset with me??? Do you generally ask for help and then roll your eyes at people, who probably have a fair amount of experience and aren't getting paid to respond, when they try to assist? I tend to find rolling eyes at people is almost universally considered offensive, regardless of the language spoken. Certainly, that's the case in Canada. Had you simply asked for clarification without rolling your eyes at me, I would have tried my best to answer further questions. As it is, this is now the second time you're rolling your eyes at someone who tried to help you. By the way, your semicolon usage suggests to me that your English comprehension is better than some native English speaking people I know. I mean that sincerely. I will say, so that you don't continue to pursue red herrings, that point A (types of NAT) isn't related to your problem. UDP timeouts and NAT corruption could be. If the issue is UDP timeouts, and if you're unable to use third party firmware or buy a router that allows you to adjust UDP timeouts, which, in my opinion, is what people who use SIP services should be doing, then you're left with adjusting the keep alive interval and failed retry timer settings, both of which are set to very specific recommended values by Freephoneline: https://support.freephoneline.ca/hc/en- ... redentials. Increasing the Failed Registration Re-Try Interval (from 120s) will not harm anything. Reducing it can cause problems. Changing SIP OPTIONS Keep Alive Interval (20s), especially increasing that value, can cause problems. Or you could just keep rebooting devices after power outages, after you're leased a new IP address, or after your internet service drops and returns. I wish you well. Goodbye. Liptonbrisk, my apologies for making you upset! If we would talk face to face, you would see that I am a normal human being and do not roll my eyes on people. Regarding my English and usage of semicolon is easily explainable: I am writing everything in MS Word, check for spelling, punctuation and different synonyms before posting it anywhere. Had to Google your “red herrings” expression in order to understand you. I appreciate short and detailed explanation in your last message, as it was hard for me to swallow the previous messages, many technical terms I had to Google. It was walk in the dark forest for me! I am very happy with my modem/router combo, it uses NAT port firewall. I am afraid to put too much load by adding router on my power receptacle, as I have aluminum electric wiring in my old house. I don’t want to burn my house down! I am grateful for your patience and thank you for valuable/priceless input in this forum! I am locking this post as this is for documentation only.